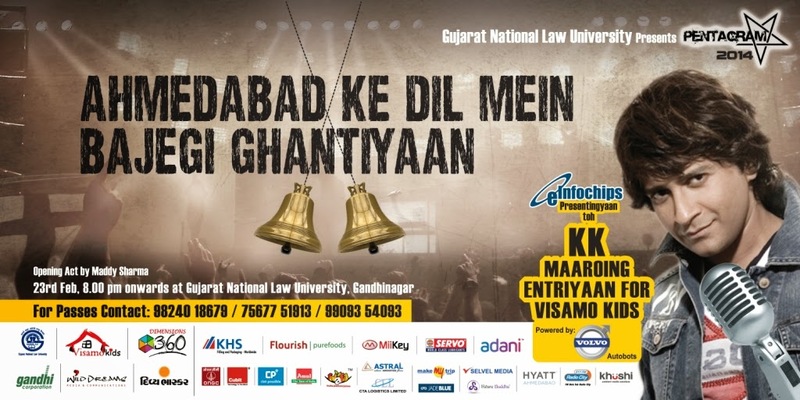 Gujarat National Law University’s Pentagram is hosting a concert of KK, one of the most popular singers in Bollywood industry. From Pyaar Ke Pal to Ek Pal Ke Liye - from Main Khuda to Dil Ibaadat - from Power Ballad to Ye Kahaan, singer KK has touched many hearts, stimulated many minds, changed many lives, inspired many souls, all through the raw power of his voice. With this event, KK is lending his voice for a cause. The ticket sales proceeds of the concert shall go to Visamo Kids Foundation. About Visamo Kids Foundation, Visamo Kids foundation is an NGO, run by the Calorx foundation in Ahmedabad, it is where children belonging to the below-poverty-line strata of society, who live in environs that are not conducive to education, are provided schooling as well as a direction in shaping their careers.